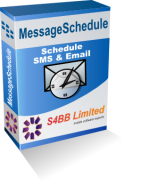 With MessageSchedule™ for BlackBerry® you can now schedule email and SMS messages to be sent at a certain time or date. It is also possible to schedule replies and forwards directly out of the BlackBerry® Messages as well. Use MessageSchedule when you meet your Buddies! Imagine … you are out this night drinking with your buddies but you do not want your loved ones to worry so you want to send them an “I miss you honey! It is so busy at work – I will be home soon. Love you!” SMS or E-mail later on. However because you are out drinking and having lots of fun, you might just forget to send the message. With MessageSchedule(TM), you can preset messages to be sent at the right time so you can have fun with peace in mind! Create, view, edit and deleted scheduled SMS and E-mail messages. Send an SMS or E-mail at a specified time. Record the sizes and number of SMS and E-mail messages sent. Keep track of the total cost of all SMS and E-mail messages which have been sent with MessageSchedule. Schedule a reply or forward easily from the BlackBerry® SMS and E-mail application. Create message templates for quick scheduling of previously scheduled messages.